Designing for Developers or Universities: What’s the Difference? – Information and thought leadership on this dynamic market! 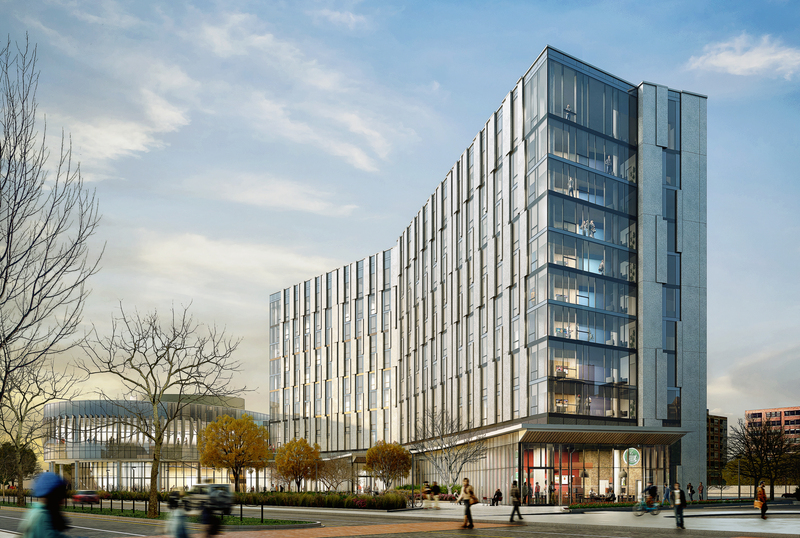 As Public-Private Partnerships (“P3”) continue to gain steam on campuses across the country, many of our clients are interested in how this delivery method affects our process as architects and ultimately, the final design for a building. As a firm that works across all delivery methods, the main difference in a P3 project is that our client is the developer, and the developer’s client is the university; however, no matter the organizational structure, the design process remains the same. The schedules may be tighter, but we still go through all the same phases and approvals. With respect to design, we think this is an exciting time in the evolution of student housing. 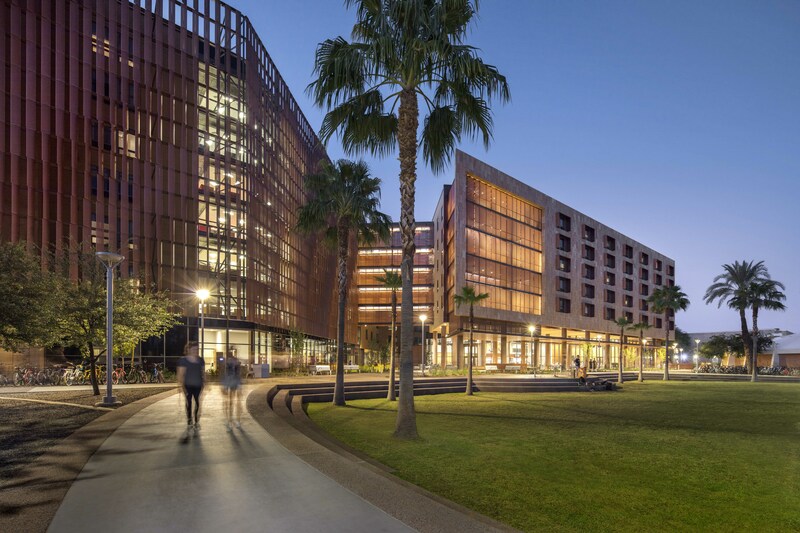 Developers, a new generation of students, and influences from urban residential and workplace sectors are all bringing fresh perspectives to campuses and helping to transform the residential experience. Design that supports building community in residence halls is not new. Universities and residence life departments have long understood the importance of shared spaces and inclusive programming aimed at getting students out of their rooms and meeting their cohorts. Developer-led projects in this aspect are no different; community is still key. As architects, we are interested in how design can support and encourage resident interaction at the most basic level. We know that placing amenities along primary circulation paths through a residence hall will lead to increased usage, and thus more residents meeting each other. We frequently hear from students that shared community bathrooms continue to be a place where residents meet. Our designs have evolved and now we incorporate gender-neutral individual toilets and showers behind secure, locked doors with open lavatories. Another necessary amenity that has evolved is laundry. No longer tucked away in basements, laundry rooms have been combined with study or lounge space, providing students the opportunity to meet while doing this necessary chore. As a firm that has designed over 36,000 beds over 30+ years, one would think we have done every unit type possible. But, we haven’t. While our projects directly for universities have generally used more traditional unit types (double, semi-suite, suites, etc. ), our developer clients are more open to experimenting with new unit types on campus. For example, we designed a two-story, eight-person suite with a dramatic double height shared living area for our recent P3 project at Butler University. That is not something that a university would typically consider, but a developer can see the potential for additional rent and thus is more inclined to do it. Developers are also usually operating “in real time” with a continuous stream of student feedback from their other projects. With the sheer quantity of work they are doing, they are able to try new ideas in one project and know pretty quickly what is and isn’t working. 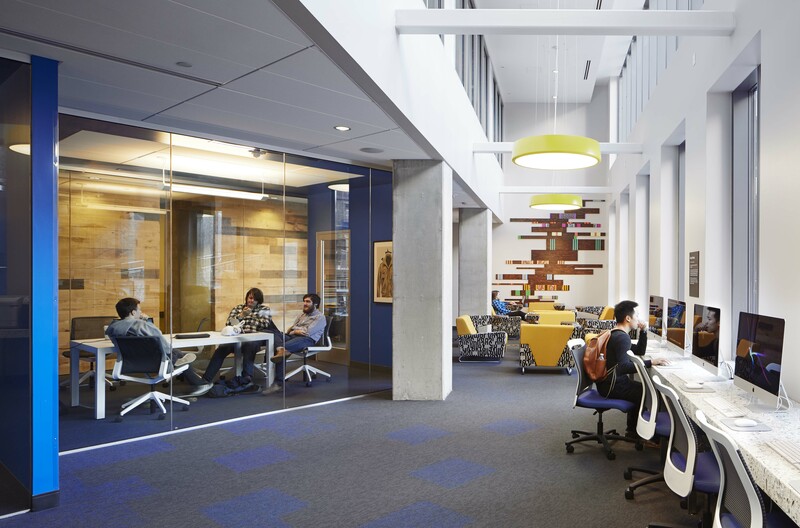 A student success center at The Summit at University City on Drexel University’s campus offers a variety of small group study rooms along with an open study lounge. Image courtesy of Solomon Cordwell Buenz/Dave Burk Photography. What’s the difference between co-working and group study? Not much, when looking at some of our most recent on-campus P3 housing projects. One key difference we see between university- vs. developer-led projects is the overall square footage dedicated to student lounges and study spaces. Universities typically build more into a project; but that is not to say that P3 projects are deficient in this aspect. What they lack in square footage, they make up for in impact by typically consolidating amenities to one floor, often the ground floor. In terms of design, we incorporate a lot of the planning strategies we use in the workplace interiors market: larger, open, community study lounges, interspersed with a variety of private group study rooms for varying group sizes. Harrison Hall at the University of Illinois at Chicago combines 500 beds of undergraduate housing with a 55,000 SF academic classroom building. Image courtesy of Solomon Cordwell Buenz. 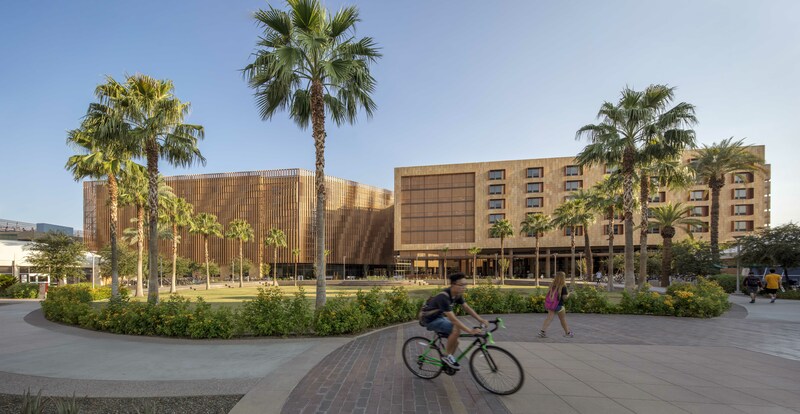 Tooker House at Arizona State University delivered 1,600 beds of freshman housing in 25 months, from start of design to completion of construction. Image courtesy of Solomon Cordwell Buenz/Bill Timmerman Photography. Much as in the multi-family residential market, the faster a building is open for residents, the faster a developer can begin to reap the benefits of its investment. And, the faster the university can see a return on its investment as well. P3s are pushing universities to move at speeds frequently not seen on campuses. Often, if a university isn’t prepared with the right team of decision makers, this can be challenging and potentially threatening to the project as a whole. Our job as designers is to move fast for our client, the developer, while simultaneously ensuring that the university’s campus aesthetic is respected and its needs are met. At the end of the day, P3s and university-funded projects share one common goal – to attract and retain students. As such, our role as architects remains the same in both university and developer-led projects. Budgets and schedules must be adhered to, innovative and beautiful design is a must, and the quality of a student’s residential experience is the ultimate measure of our success. JIM CURTIN is a Principal at Solomon Cordwell Buenz (SCB) an architecture, planning, and interior design firm with offices in Chicago and San Francisco. He is a nationally recognized expert in the planning and design of campus environments and student housing. As a leader in SCB’s Campus Environments practice, Jim’s designs foster a sense of community, promote a connection to place, and seek to ultimately enhance student success. Throughout his career, Jim has worked on 35+ campuses across the country, designing both P3 and University-led projects that are unique, sustainable, and responsive to their environment. Jim is a founding member of the Association of College and University Housing Officers International (ACUHO-I) 21st Century Project, a national effort to envision the future of student housing and has presented at numerous national education conferences, including the Society of College and University Planners (SCUP) and the InterFace Student Housing Conference. Jim received his Bachelor of Architecture degree from the University of Notre Dame. Previous Article When Structuring a Student Housing P3, Why Would a School Use an Equity Structure?